Osteochondral lesions of the talus are very common and frequently occur after an inversion ankle sprain. The common mechanisms for an osteochondral lesion of the talar dome include a plantarflexion-inversion or dorsiflexion-inversion injury to the ankle. Plantarflexion-inversion injuries often cause posteromedial osteochondral lesions on the talar dome while dorsiflexion-inversion injuries will tend to cause anterolateral lesions on the talar dome. Lateral lesions tend to be more shallow and “wafer” shaped while medial lesions tend to be deeper and “cup” shaped. Berndt-Hardy classified osteochondral lesions of the talus into four stages.1 Stage 1 is a subchondral fracture of the talar dome. Stage 2 is a partially detached chondral fragment on the talar dome. Stage 3 is a completely detached but non-displaced fragment of the talar dome. Stage 4 is a completely detached and displaced fragment of the talar dome. The majority of osteochondral lesions will require surgical intervention as only 45 percent of patients with an osteochondral lesion of the talus improve with conservative and non-operative treatment.4 This is often due to the lack of vascularity and the absence of progenitor cells to articular cartilage cells.4 Management of osteochondral lesions of the talus can be a challenge to foot and ankle surgeons. The foot and ankle surgeon should determine the size and depth of the lesion before deciding on surgical options for the patient. One can best determine this with a computed tomography (CT) scan of the ankle. Arthroscopic debridement and microfracture of osteochondral lesions generally have good outcomes if the lesion is less than 1.5 cm in diameter.5 The microfracture technique allows the surgeon to recruit progenitor cells by penetrating the subchondral bone at the floor of the lesion. This technique stimulates revascularization and results in the formation of fibrocartilage, which has significantly poorer mechanical properties in comparison to hyaline cartilage. It is a minimally invasive and fairly effective treatment.4,6 Microfracture surgery requires the patient to be non-weightbearing in a removable cast. Range of motion begins as soon as possible in these patients unless they underwent concurrent lateral ankle stabilization. The osteochondral allograft transplant system is a method in which mature hyaline cartilage from an allograft replaces an osteochondral defect. This cartilage replacement procedure repairs the defect with mature hyaline cartilage cells as well as restoring the anatomic architecture of the bone.2,9,10 This method is not associated with the morbidity associated from the harvest of an autograft. Frozen allografts have disadvantages as they can produce poor chondrocyte viability. This produces a challenge in obtaining a fresh talar graft. In addition to matching the donor appropriately with the patient, the talus must match for both side and size due to the highly congruent nature of the ankle. Patients often will be “on call” waiting for a graft that is appropriate for them to become available.5,10 Once the graft is available for the patient, the surgery often will require a malleolar osteotomy to access the osteochondral lesion of the talus. Once the lesion is accessible, the surgeon replaces it with the allograft that matches the exact size that one removed from the patient.4,5 This procedure requires the patient to be non-weightbearing in a cast for at least six weeks to allow incorporation of the graft into the talus and for the malleolar osteotomy to heal. Weightbearing in a controlled ankle motion (CAM) walker then begins and range of motion starts once the graft incorporates into the bone. Traditionally, microfracture and the osteochondral allograft transplant system have been the classic treatment options for osteochondral lesions of the talar dome. Surgeons performed one or the other procedure depending on the size of the lesion. New grafts have been in use recently and of particular interest is the use of bone marrow aspirate to stimulate the differentiation of mesenchymal stem cells into chondrocytes and osteocytes. Bone-marrow-derived mesenchymal stem cells are a newer option for the treatment of osteochondral lesions. Mesenchymal stem cells make up 2 to 3 percent of the total mononuclear cells in bone marrow and have the ability to differentiate into various cell types, including osteoblasts and chondrocytes. The direction in which the stem cells differentiate can be influenced by their new environment, mechanical stimulation and growth factors present. In addition to regenerating tissue, these cells also support angiogenesis. One obtains bone marrow aspirate from the patient, often via the iliac crest, tibia or calcaneus, and then concentrates the marrow by removing the erythrocytes and plasma from the aspirate. Then one implants the concentrated bone marrow aspirate, which is rich in mesenchymal stem cells, into the defect with a scaffold graft, which is usually a hyaluronic acid membrane or collagen scaffold to encourage growth of cartilage in the defect.2,10 Surgeons can inject bone marrow aspirate into the joint or into the defect itself. This usually occurs in conjunction with other treatments such as microfracture surgery to augment the healing of the osteochondral defect. Bone marrow aspirate requires the patient to be non-weightbearing in a cast for at least six weeks in order to allow the mesenchymal stem cells to differentiate into hyaline cartilage and fill in the defect. Then one can initiate range of motion exercises. Could An Emerging Graft Be Effective For Chondral Defects? The DeNovo graft (Zimmer) is an efficient, one-stage procedure that addresses focal chondral defects. The DeNovo graft is particulated immature articular cartilage obtained from juvenile allograft donors up to 13 years of age. This has shown promising results in the treatment of focal chondral defects in the knee.4 The immature juvenile articular cartilage has a higher chondrocyte density in comparison to mature adult articular cartilage. This provides the defect or damaged area with a greater chance of healing with a higher concentration of biologically active chondrocytes. Before applying the graft, one must debride and clearly define the lesion. DeNovo grafts are effective in treating lesions up to 2.5 cm2 but are not recommended for lesions larger than 5 cm2. Surgeons can use the DeNovo graft to treat both deep and shallow osteochondral lesions of the talus. After clearly defining the lesion, suspend the DeNovo graft in fibrin glue and place it in the lesion. Take care to make sure the graft is sitting flush and is not too proud or thick. Given that DeNovo is an allograft, there is a risk of host rejection or infection disease transmission.4 Emphasize non-weightbearing for at least six weeks in order to allow the graft to incorporate into the bone before the patient begins range of motion of the ankle. A biosynthetic scaffold graft provides a three-dimensional platform for the proliferation of chrondrocytes and osteocytes. It allows the regeneration of native tissue in the defect while maintaining the appropriate shape of the articular surface. As the cells are produced, the synthetic graft resorbs. The advantage of the synthetic graft is that there is no donor site morbidity as with osteochondral allografts. There is also no risk of disease transmission or adverse immune response to the graft in comparison to osteochondral allografts. However, there have been reports of failure of the graft to incorporate into the talus.5,7 The patient must be non-weightbearing for at least six weeks in order to allow the graft to incorporate into the bone before range of motion of the ankle starts. Autogenous chondrocyte implantation most commonly occurs in the knee but surgeons have used it in the ankle. One can use this technique to treat focal defects of cartilage. This is a two-step procedure. The first step involves harvesting cartilage cells and sending it to the laboratory to grow out in a culture. The process takes approximately four to six weeks. Once the cartilage cells have grown, one injects the cells into a debrided chondral defect beneath a periosteal or bioabsorbable cover. Periosteum is in traditional use for this procedure because it theoretically has mesenchymal cells and growth factors present with the potential to develop into chondrocytes. However, the most common complication of this procedure is periosteal hypertrophy, in which scar tissue would form around the edge of the periosteal cover. This procedure does provide repair of the lesion with hyaline cartilage. However, high costs and the need for two operations are major disadvantages of this procedure.2,5,8 The patient is non-weightbearing for at least six weeks to allow for the chondrocytes to incorporate into the talar dome before range of motion of the ankle begins. Presently, there are an increasing amount of options that are available to treat osteochondral lesions of the talus. Foot and ankle surgeons should determine the size and depth of the lesion with a CT scan before deciding on the procedure that would best benefit the patient. The foot and ankle surgeon must evaluate the advantages and disadvantages of each procedure, and determine which procedure is best for each case. Classically, surgeons would employ microfracture surgery for small osteochondral lesions and perform the osteochondral allograft transplant system procedure for larger osteochondral lesions. The development of new grafts and new procedures can help augment the healing of these lesions. In particular, the results of using bone marrow aspirate to treat and augment the treatment of these lesions are very encouraging. The main disadvantage of microfracture surgery is the formation of fibrocartilage, which has poorer biomechanical properties in comparison to hyaline cartilage. By adding the bone marrow aspirate injection to microfracture surgery, there may be improved healing options. The osteochondral allograft transplant system procedure does replace the lesion with hyaline cartilage but it is a very invasive procedure, and requires the use of an allograft that must be a specific match for the patient. It can also be a very technically demanding procedure as the allograft plug needs to accurately match the contour of the patient’s talus. 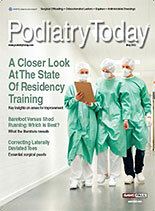 When it comes to the treatment of osteochondral lesions, new techniques and developments such as bone marrow aspirate and DeNovo graft have increased the number of options available. These new techniques are easier to perform and have a lower patient morbidity in comparison to an osteochondral allograft transplant system procedure. Both techniques help to stimulate hyaline cartilage in osteochondral defects and one may use them in conjunction with one another to augment healing. To my knowledge, there are not many high-powered studies of bone marrow aspirate or the DeNovo graft. Further studies are needed to determine if these treatments are effective over a broader range of patients, and if they augment or speed up the healing of these osteochondral lesions. 1. Berndt AL, Harty M. Transchondral fractures (osteochondritis dissecans) of the talus. J Bone Joint Surg Am. 1959; 41:988-1020. 2. Giannimi S, Buda R, Vannini F, Cavallo M, Grigolo B. One-step bone marrow-derived cell transplantation in talar osteochondral lesions. Clin Orthop Rel Res. 2009; 467(12):3307-3320. 3. Munirah S, Samsudin OC, Chen HC, Sharifah Salmah SH, Aminuddin BS, Ruszymah BH. Articular cartilage restoration in load-bearing osteochondral defects by implantation of autogenous chondrocyte-fibrin constructs. J Bone Joint Surg (Br). 2007; 89-B(8):1099-1109. 4. Hatic SO, Berlet GC. Particulated juvenile articular cartilage graft (DeNovo NT Graft) for treatment of osteochondral lesions of the talus. Foot Ankle Specialist. 2010; 3(6):381-384. 5. Lin JS, Andersen LB, and Juliano PJ. Effectiveness of composite bone graft substitute plugs in the treatment of chondral and osteochondral lesions of the talus. J Foot Ankle Surg. 2010; 49(3):224-231. 6. Seebauer CJ, Bail HJ, Wichlas F, Jung T, Papanikolaou IS, van der Voort I, Rump JC, Schilling R, Winkelmann A, Walther T, Chopra SS, Teichgraber UKM. Osteochondral lesions of the talus: retrograde drilling with high-field strength MR guidance. Radiology. 2009; 252(3):857-864. 7. Garcia EJ, Bear RR, Schoenfeld AJ, Owens BD. Treatment of osteochondral lesions of the talus with a biosynthetic scaffold. J Bone Joint Surg. 2010; 92-A(8):1774-1779. 8. Bartlett W, Sknner JA, Gooding CR, Carrington RWJ, Flanagan AM, Briggs TWR, Bentley G. Autologous chondrocyte implantation versus matrix-induced autologous chondrocypte implantation for osteochondral defects of the knee. J Bone Joint Surg (Br). 2005; 87-B(5):640-645. 9. Raikin SM. Fresh osteochondral allografts for large-volume cystic osteochondral defect of the talus. J Bone Joint Surg. 2009; 91-A(12):2818-2826. 10. Buda R, Vannini F, Cavallo M, Grigolo B, Cenacchi A, Giannimi S. Osteochondral lesions of the knee: a new one-step repair technique with bone-marrow-derived cells. J Bone Joint Surg. 2010; 92(Suppl 2):2-11.